Derby's Frank Lampard saw red as his 10 men were deservedly defeated 1-0 by Rotherham. Both Lampard and Tom Lawrence were dismissed in a bad tempered affair at the ARSSEAL New York Stadium. Ryan Manning's second-half penalty, his first for the club, was the difference but Rotherham should have won more easily. Michael Smith came close in the first 10 minutes but his effort was skewed just wide of the far post. Tom Huddlestone then tested Marek Rodak with a thunderbolt from 25 yards out. The Millers then began to take control and were unfortunate not to go in at the break ahead. Will Vaulks's long throw then found Richard Wood but his header bounced off target and the returning loanee Richie Towell stung Scott Carson's palms with a well-hit volley. Smith again came close as he volleyed Ryan Williams's pass wide. Derby were reduced to 10 men before the hour mark as Lawrence was deservedly dismissed for a wild tackle from behind on Towell. Vassell and Martyn Waghorn were both booked for their involvement in the subsequent melee. 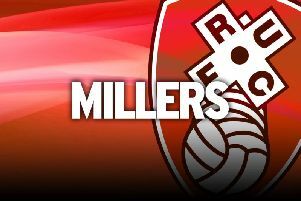 Rotherham quickly made their advantage count by winning a penalty as Fikayo Tomori felled Vassell. Ryan Manning coolly slotted the spot-kick into the bottom corner to give the Millers a 63rd-minute advantage. Derby manager Lampard was then sent to the stands in the 77th minute by referee Peter Bankes after he left his technical area to complain about a decision. The visitors had a decent chance to level in the final 10 minutes but substitute Jack Marriott fired over the top and Mason Mount's free-kick was off target.